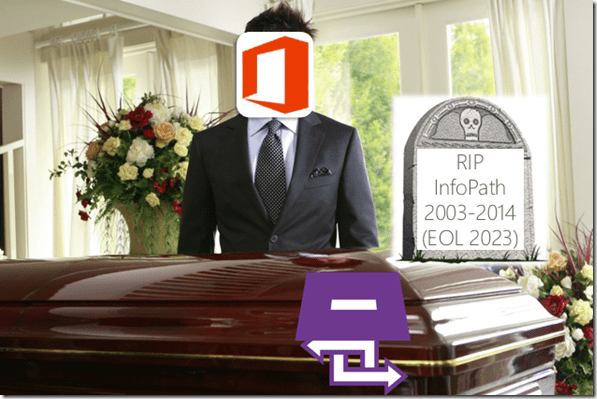 InfoPath is Dead. What are you going to do now? Our beloved InfoPath is dead and buried now. This electronic forms tool from Microsoft was a shining star way back in 2003. I was involved in building a lot of InfoPath solutions over many years. I had my fair share of grey hairs and late nights thanks to InfoPath. But we also delivered incredible solutions using it. Now it is gone for good. We started moving all our forms applications to K2 SmartForms in 2012. I had a series of presentations on InfoPath at the SharePoint Saturdays around the country where I shared my migration strategy for InfoPath based solutions. I shared how we perform InfoPath surgery and many other tricks of the trade openly with the community. If you are still tied to InfoPath applications due to whatever reason, Now it is the best time to completely close the chapter and look at future options. Our friends at K2 have organised a webinar and I invite you to register and hear what they have to say. Don’t miss this opportunity to learn how to manage the InfoPath crisis. jEyLaBs offers a migration program to K2 SmartForms. This is a tailor made K2 SmartForms architecture and best practice implementation & migration service. This is aimed at organisations looking to automate paper forms on the K2 business process application platform or migrate existing InfoPath forms implementations. We assist with converting InfoPath applications into SmartForms and Mobile apps making sure that existing data, reports and security are kept intact. jEyLaBs has been closely working with the K2 SmartForms technology since its alpha release. We have seen firsthand how hard the K2 development teams worked to incorporate the many rounds of feedback from the field to make K2 SmartForms a solid addition to the K2 platform. jEyLaBs has invested considerable amounts of time and effort in investigating and doing Research and Development on K2 SmartForms as an alternative to InfoPath forms. We are pleased with this effort and the result is we are heavily involved in moving many clients’ eForms development efforts onto K2 SmartForms. Expect a white paper from jEyLaBs shortly on this topic. Contact us via empower@jeylabs.com.au to learn more. Keen to Get Insights into your information like never before?